Tri-State Company, Inc. Equipment Page: Shows what tools we use and how we use them. We use a wide variety of tools to accomplish our jobs. 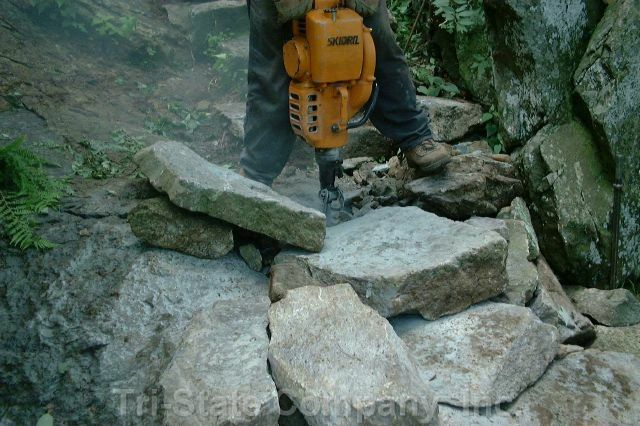 We pride ourselves in building hiking trails and other outdoor infrastructures in remote locations using primitive tools and techniques. This section of our site brings you some of those tools that we use in these remote locations and also the equipment we use in a normal environment. A lot of our tools have the ability to be backpacked to these remote locations so that we can put the best quality into our work without damaging the environment. When we build our trails we use several different methods and tools to complete the job. Depending on the specs of the trail and the location the trail is in decides what we use to build the trail. We currently have two trail machines that we use to build trail. One of our machines is for heavier construction and it is a CAT Excavator. This machine is 36 inches wide and can be used for building trail that meets the specs of that size. The next trail building machine that we use is a Gravely Tractor. This machine is about 24 inches wide and can be used for building trail matching this measurement. This machine is the primary machine we use when building trails. Depending on the type of forest we are in, if it is a wilderness type or low impact, we use the commonly used tools for trail building a Pulaski tool and fire rack. We have done many projects that require the use of these types of tools and so we have a vast collection of hand tools for building trail. This includes tools like Pulaski, fire rake, snipes, pole saw, spud, pry-bar, etc. 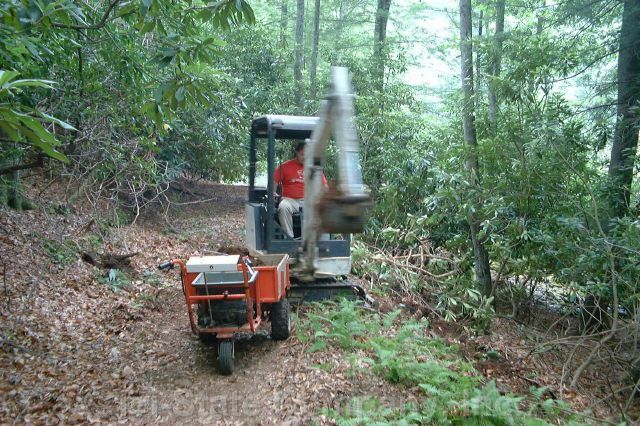 We also do trail work were it requires us to move large rocks and to do so where we are unable to use heavy machinery. For this type of work we use manual labor with spuds and pry-bars. Though, we also have some lighter machinery to move these types of rocks. One tool that we use for this type of work is a chain-saw winch. With this winch we have an extensive collection of blocks, cables, and slings for rigging and anchor points. We also use hand winches to help move rocks and for pulling stumps and other obstacles on the trail. Before the initial ground breaking of a new trail you need to clear the brush from the planned route of the trail. We have a wide variety of clearing machines from a BCS to DR walk behind tractor mowers. Depending again on the location and specifications we might use a weed eater for tight areas were we couldn’t get a mower through. If in a Wilderness area we have “idiot sticks” for clearing. We have a wide range of electrical tools that we use for timber construction. For this type of work we have a small and large generators that can either be backpacked or carried by a couple of workers. We also do a lot of rockwork that requires us to either pin the rock to the ground or that requires the rock to be broken. For this we use a Skidril that can be backpacked into a remote location on a pack frame. In the future we hope to have more pictures on this page to showing our tools in use. We are also planning to have sequential shots that show some of the work we have done and how we did it. This website is maintained by Tri-State Company and Skynet Publications. Any feedback or questions contact the webmaster.